Karamu Jatta has been the wonder kid over the years as he was not sure of his capabilities but of recent Karamo has realised he has something special that most defenders lack. Kams as fondly called has assets such as good aerial combat, quick on the ball, very strong and dangerous in the opponents half, pacy, good cantering, veracious shots and above all a total team player. His ability to man mark opponent as well as overlapping shows his competence as a full back player. Due to the above mentioned assets, he is sometimes used as midfielder or a winger. He is always willing to learn and has since promised to go the extra mile. In 2007/08 he has been with Hawks youth team but was unfortunate to break through to the first team due to other engagements but is hopeful to come back soon. 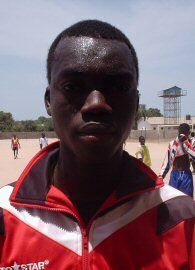 He was and is still part of Brufut United’s team that emerged champions of the Western Region Third Division and has also won series of trophies with his local club in Brufut.